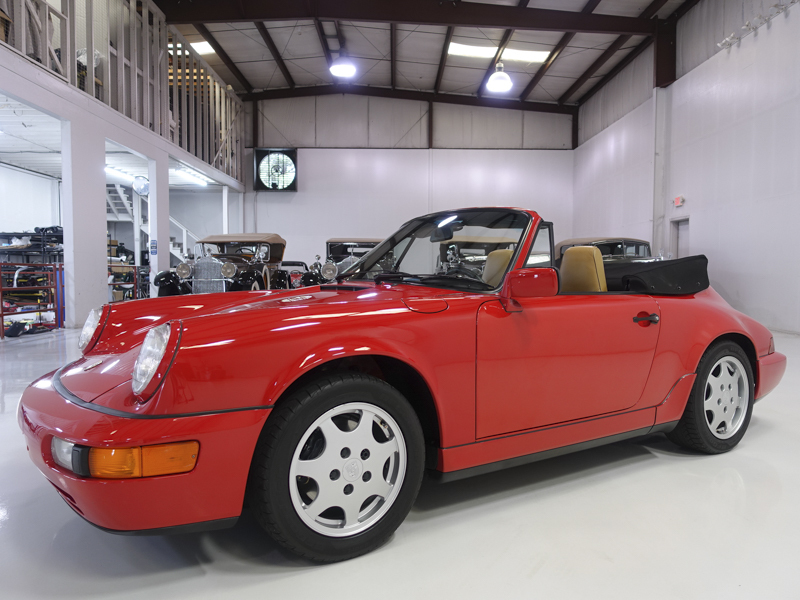 The 1990 Porsche 911 Carrera 2 Cabriolet featured here is finished in the stunning factory color combination of Guards Red over a Cashmere Beige and black supple leather interior and black power convertible top. This particular example was completed by the factory in October 1989 and sold new through the Porsche Exchange just north of Chicago, Illinois. This Carrera has been meticulously maintained and currently displays only 41,044 actual miles! Accompanying documentation includes the original tools, Porsche Production Specifications certificate and original books as well as complete service records. The warranty & maintenance book notes records from new to 2007 and actual invoices are also included that date from 2007 to January 2019. In December 2018 this 911 was subjected to a $9,000 service with a complete engine reseal and new clutch disc fitted. It performs as well as it presents and is sure to bring many years of enjoyment to its future caretaker. We are proud to offer this low mileage 1990 Porsche 911 Carrera 2 Cabriolet to the most particular collector, investor or enthusiast who appreciates low mileage and the growing appeal of the Porsche 964. Ready to make aninvestment that you can actually enjoy?Classic carshave proven to be among the most resilient and rewarding investments in recent years with the Historic Automobile Group Index (HAGI) jumping 39% in 2013, 16% in 2014 and 17% in 2015 while posting gains of 467% over the last 10 years. Pleasecontactone of our expert sales consultants for more information. They will be happy to give you a complete walk-around, supply you with a more detailed description and answer any questions you may have. Buy with confidence. This 1990 Porsche 911 Carrera 2 was listed for sale on 4-14-19 08:33:54. The vehicle color is not available and VIN is not available	. Kindly check ad for seller's location. Seller`s stock ID is danie407153_911. There are 198 other Porsche cars currently listed for sale on our website. You may desire to see what other Porsche cars are selling for by visiting our Sales Data page. You may be able to finance this car. Welcome to our collector car marketplace where we feature thousands of classified ad listings of vintage cars for sale. We hope that you will bookmark our site and visit often; our cars are updated every day. Furthermore we encourage you to subscribe to our mailing list so that we may periodically notify you of interesting classic cars that become available. ©2019 Vintage Driving Machines, Inc.